As you might expect, and making no change from their current favoured design the Galaxy Note 9 features an infinity screen which is virtually bezel-free, and the dimensions bring it in at an impressive 6.4-inch screen size. 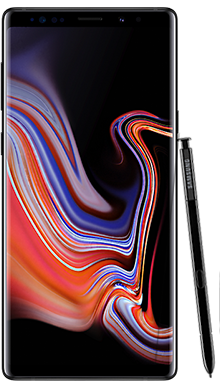 The Galaxy Note series, has a significant following, so it was no surprise that the Samsung Galaxy Note 9 was well received when it was released in August 2018. It is the latest in a series of Note models that always hit the pay monthly mobile phone arena running. Rumours have been rife about what we can expect from this handset, and the evidence is overwhelmingly positive with fans raving about the new spec of this phone. Galaxy Note phones are generally thought to be the must-have business phone but with that said it makes an equally impressive social phone. The main feature that sets the Galaxy Note handsets apart from most of the phones on the market at the moment is the inclusion of the useful S-Pen. As you might expect being so feature packed and coming from the stables of the highly respected Samsung this is a high-end mobile phone with a price tag to match but well worth the extra money so let's take a closer look. For this handset Samsung have chosen to go bigger, and it has worked well. The Galaxy Note 9 is bigger than the Galaxy Note 8 and is currently one of the biggest Android handsets on the market making this one unique mobile phone deal. The screen is Super AMOLED which offer superior colour and image quality. 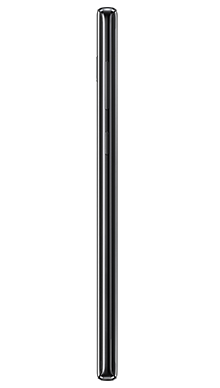 The phone maintains the favoured glass design and the screen is gently curved with storage for the S-Pen seamlessly included. This is a beautiful looking phone but worth remembering that it is pretty much all glass so for the money you spend investing in a case and screen protector is a smart move as the last thing you want to do is drop and break this beauty. Unsurprisingly there are a lot of similarities in the design to the Galaxy Note 8, but as this is also a cracking handset, there are no complaints here. As expected for a phone at this level the Galaxy Note 9 display features Quad HD+ giving a 516ppi pixel density. The handset also comes with Mobile 4K HDR which was another feature that we expected to see in this handset. With handset colour having been so well received among Samsung fans it is no surprise that the Galaxy Note 9 is offered in a few of their striking colours. Of course for traditionalists there is the Midnight Black handset, but if you are looking for a change and a break from the norm you could opt for Ocean Blue which comes with an exclusive and contrasting yellow S-Pen which some might find a little odd. The Lavender Purple phones come with a matching pen as does the Midnight Black. Finally, although not available in the UK for reasons known only to Samsung themselves there is a Metallic Copper version which to be fair looks kind of brown, so you are not really missing out with that one. The main difference between the Galaxy Note 9 and the Galaxy S9, is the inclusion of the S-Pen so just what does this little stylus offer that sets it apart from the rest of the phone world. Most people will associate the stylus with older smartphones when they first became a thing, and be aware that most manufacturers ditched them as unneeded, so why is the Galaxy Note 9 sticking so firmly to its inclusion of a pen? Basically, this clever little extra is now Bluetooth enabled, which is a bit of a game changer when it comes to pay monthly mobile phones. This takes it from useful screen aide to remote control in one easy move. With the button on the top you can now launch the camera, or any other app you fancy, take a photo either using the front or rear cameras offering the perfect selfie experience or use it for a myriad of other tasks including music playback, memes recording and viewing photos. To be fair, this has become a particular strength when it comes to efficient mobile phone use, and we think many of you are going to love it and never want to go back. As you might expect you have a combination of front-facing and rear cameras on the Galaxy Note 9. 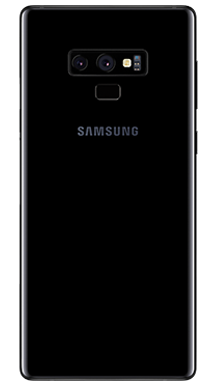 The rear camera continues the same trend as the Galaxy Note 8 and other models by being a dual camera; one is a wide-angle lens while the other is a telephoto lens. Both the rear cameras are 12mp and feature optical image stabilisation which is also found on the Galaxy Note 8. The front-facing camera offers 8mp and is the tool used in iris scanning and AR Emojis, new gear that was first seen on the Galaxy S9. The cameras are loaded with the now standard Samsung gadgetry supporting the photographer by flagging up things like blurriness and eye blinking, meaning even the most inept snappers will end up with pretty awesome pictures. So what is inside this cool piece of kit? Well, the Galaxy Note 9 comes with the latest Exynos chipset (for users within the UK). You can choose between a handset that offers the user 6GB RAM/128GB storage or 8GB RAM/512GB storage but of course, don’t forget that Samsung includes the microSD option meaning you can expand with 512GB more. Overall this means the larger capacity phone can offer a whopping 1TB of storage which is pretty impressive. In terms of battery, you are looking at 4,000mAh battery which to you and I just means it is really good and offers a fantastic battery life. To charge the phone, you can use the included lead for Quick Charging, or you can purchase a wireless charger as this is supported as standard. The wired charging port is a USB Type-C charger which can also be used to contact to an external display if you purchase the USB-C to HDMI adapter. The audio function is pretty unremarkable in that it meets the standard you would expect from a Samsung phone of this high-level specification. You will find AKG-tuned speakers that have Dolby Atmos enhanced audio which is what comes with the Galaxy S9. With the phone, you get the proprietary AKG headphones, but of course, you could switch to wireless if preferred. One change from the Galaxy Note 8 is the relocation of the fingerprint scanner, which has been moved to sit under the camera mimicking the Galaxy S9 and reinforcing the popularity this move caused among users. This is a serious high-end phone that is packed with many features but as previously mentioned has a price tag that reflects that. The basic handset, if you were opting for SIM-free, starts at £899 for the smaller storage model and £1099 for the larger version, so we are in iPhone X territory here. But that said with the amount of technology on offer, and with the myriad of deals we have, it is going to be just as popular and affordable as the Apple counterpart. The Galaxy Note 9 will appeal to business users as it has so much functionality and the addition of the S-Pen makes it a powerful tool to take on the road, rivalling the need to carry a laptop or tablet. With the serious amount of storage available and the useful productivity tools we can see this being a real boon if you work on the road and do not have regular access to an office. That said the powerful features that have been added to the S-Pen are equally going to appeal to social users as this easily can be used as a fun camera with access to everything a user could need. The battery life is impressive thanks to the 4000 mAH battery so you can head out and about safe in the knowledge your phone will perform all day until you can get back to a charger later on. So despite the fact we are looking at the most expensive Samsung today we have been working to ensure we can get the best Samsung Galaxy Note 9 deals possible for our customers. Our team have been on a mission to make sure they can save you as much money as possible and leave you with a Galaxy Note 9 in your hands. At Fonehouse we have the best deals from EE and Vodafone, so we are confident that our customers get the best network service and connection wherever they are. Both Vodafone and EE offer some really great extras on some of their tariffs so you could also benefit from these awesome deals. For example, you could choose a subscription to BT Sports to make sure you don’t miss out on all of the latest sporting action, as well as six months free Apple Music where you don’t even need to worry about paying for the data! 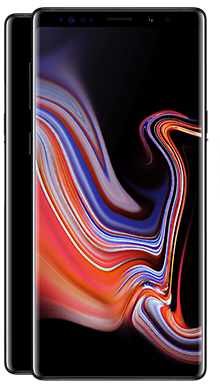 If you’d like to find out more about the Galaxy Note 9 or if you’d like to find out more about a specific deal with Fonehouse then why not call one of our customer service team today, on 0333 900 1133.